I've come to realize over the years since becoming a homeowner that painting doesn't always have to be thought of as such a draining task, and it also doesn't always mean time consuming. At first, I dreaded painting anything in our home simply because I had this idea that it would be horrible, but I was wrong and I've grown to love it (as I'm sure you've noticed with all my crazy DIY projects!) because of how easy it is to transform even the smallest of items in your home that result in dramatic differences. I love being able to put my own creative touch on items in our home to fit our style and it's so easy to do so by just adding a couple coats of paint. Giving something a complete makeover by just adding some paint and being done within a couple of hours? Count me in. Much like how most of my projects start, I first turned to Pinterest because I have been hoarding this collection of clear vases and wanted to try and get some color inspiration for giving them a makeover with my favorite Glidden paint (the swatches are easy to pick from and color goes on smoothly). 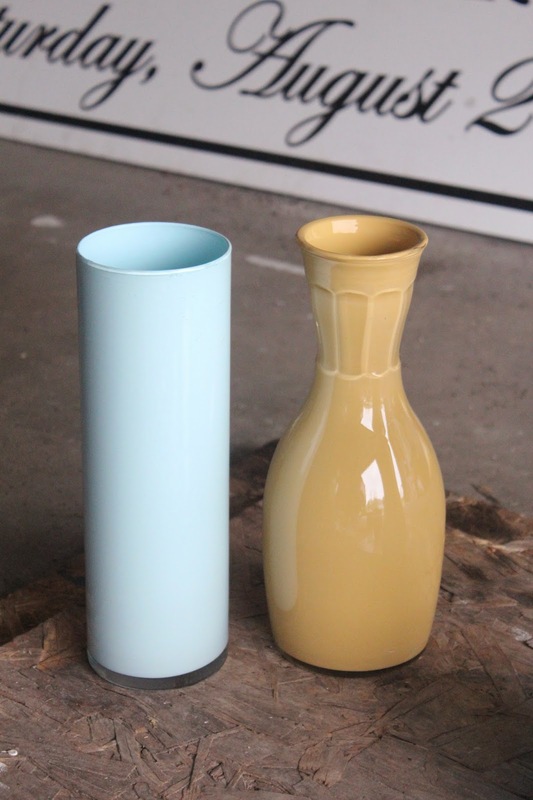 I was pretty much sold on a gold + turquoise blue combination for these vases after pinning only a few items that inspired me (you can see my full board full of inspiration for this project here). 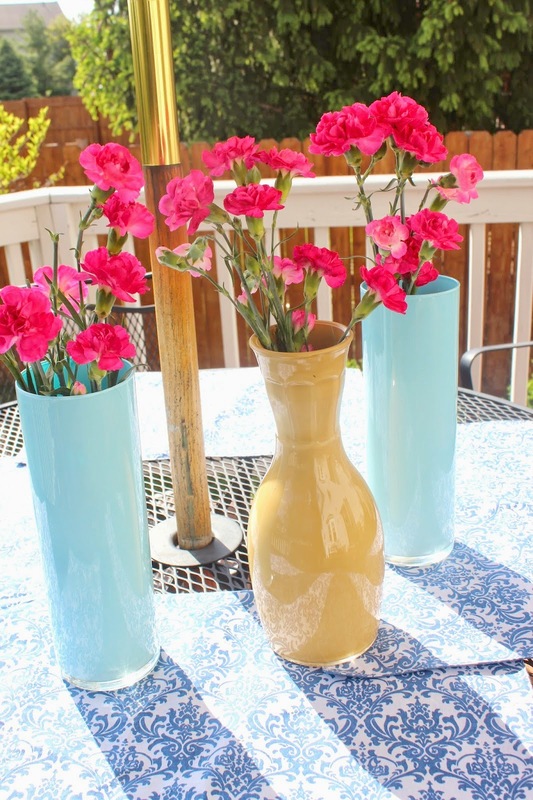 So, my newest project was born: DIY Painted Glass Vases! 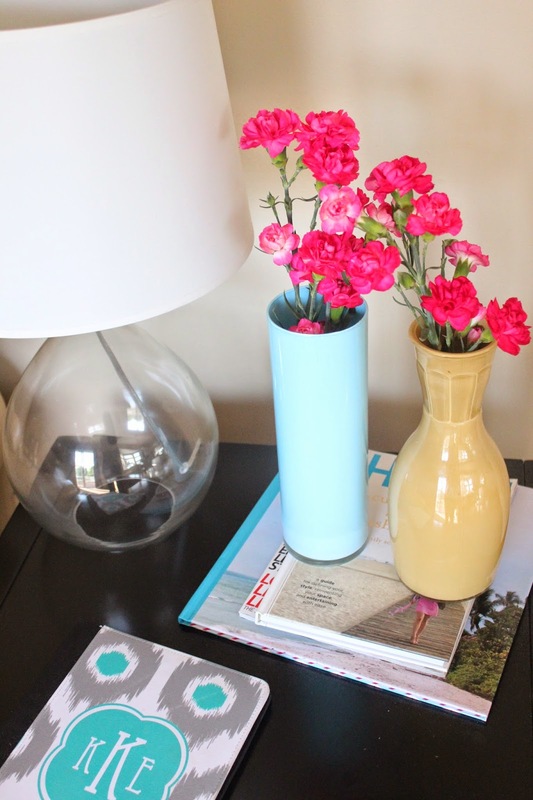 I promise that any of you can do this project, and your new pretty vases will be so happy you did! They are just begging for a makeover. Step 1: Instead of brushing the inside of the vases, we used a swirl and coat method. Pour the paint in the bottom of your glass container. Step 2: Tilt the glass from side to side and let the paint swirl around in the vase until you get it completely covered. 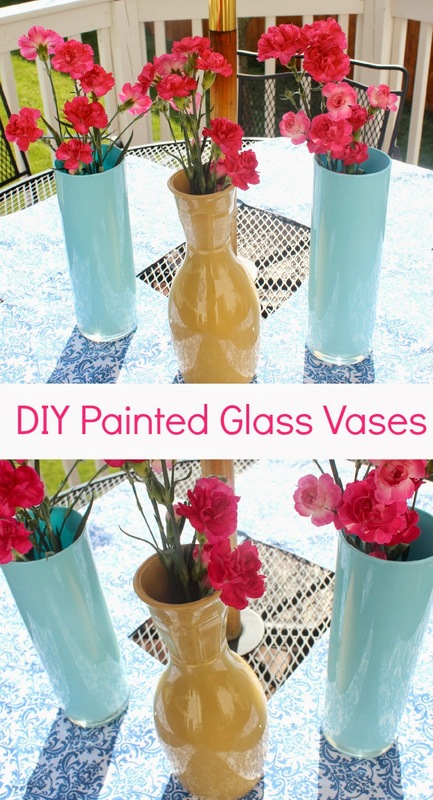 You can turn the vase upside down and use the plastic cup to let any excess paint drip out. 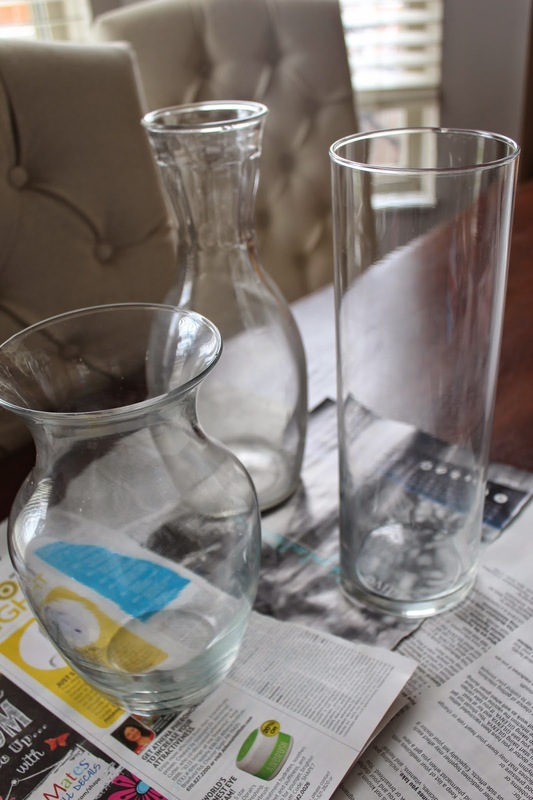 Step 3: Allow your vase to drain upside down on a paper towel (I recommend doing this somewhere outside for obvious reasons) and make sure you wipe off any paint that may have got on the outside part of the glass. Step 4: Place vase upright again to let dry in a warm area. Check your paint can for drying time. Once the inside is completely dry, spray a water-based lacquer over the painted area to protect it. You won't want to miss this step if you plan on putting any kind of liquid inside! From here, all you need is some fresh flowers and voila! 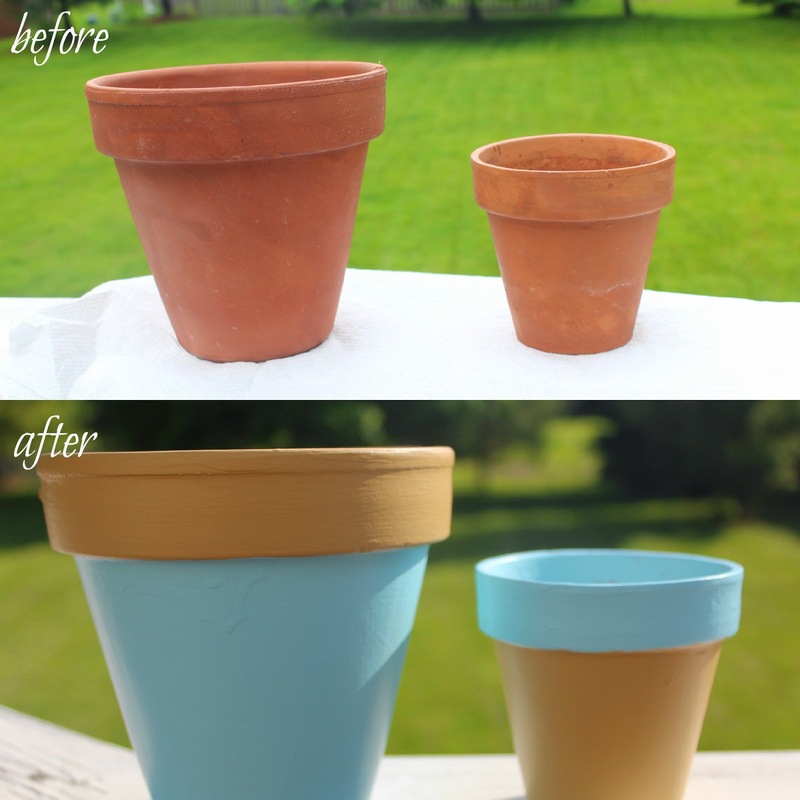 At the last minute since I loved using these Glidden paint colors so much I decided to spruce up some old ceramic planting pots I had in our garage. I just wiped them down first with a wet paper towel and then painted them with a foam paintbrush... easy, 10 minute project! 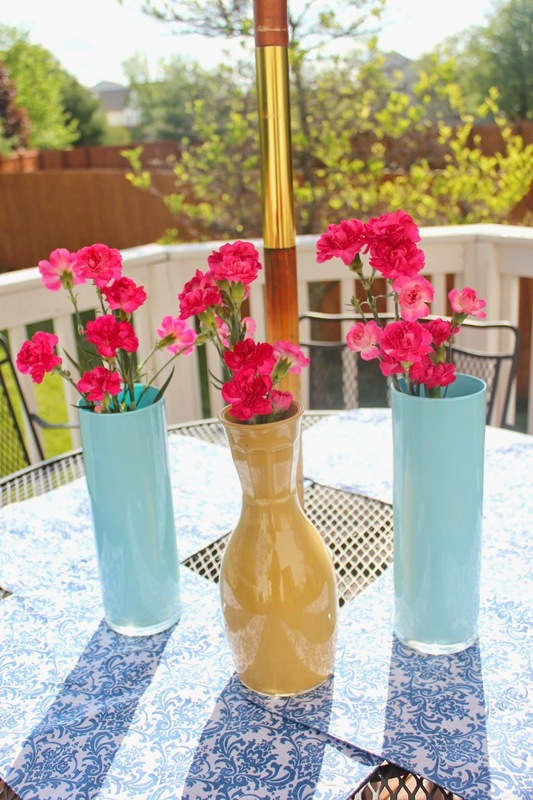 And last but not least, if you aren't wanting to keep your vases outside, you can always style them inside. I love how these vases look in our family room, much more appealing than the old clear ones! *Now since you all just listened to me ramble on and on about paint, tell me what you enjoy painting the most in your home and you will be entered to win $100 Visa Gift Card! I enjoy painting furniture the most. I have done dressers, desks, dressing tables, an armoire, a HUGE railroad storage unit, coffee tables, etc. I can't stop! https://twitter.com/tammigirl/status/486150393383378944 - a tweet about it. I love painting and repurposing mason jars. We used them as centerpieces for my wedding and then I have reused them for all kinds of things in my home. I'm not a seasoned painter, but being new homeowners I see a lot of painting of walls in our future. I love painting the walls in our house. It's a big task, but it's amazing how you can transform a room with just a little paint. I also painted a ton of items for our wedding. It was great to take a bunch of inexpensive, mix-matched items, and make them all work together with just a little white paint. It really pulled everything together, and would have been so much more expensive and time consuming if I would have tried to find items that matched already. Oh my gosh, love those vases! I definitely DONT love painting rooms, that gets old and wears me out, but I do like little DIY projects like this. I love the small things that reall spruce up the place and make a difference! Those turned our beautiful & look perfect on the end table! I enjoy painting furniture, like end tables and dressers. It is amazing the transformation that can happen with a new coat of paint. I love painting small spaces accent colors, like the back of a bookshelf. It adds a pop and takes no time at at all! I mostly enjoy painting walls and old furniture! Now I want to try vases. Thanks for the idea! Love this idea! Thanks Katie!!! I enjoy painting walls, I find it therapeutic! Wow, your vases came out amazing! I will have to check out that paint, the colors are stunning. I enjoy painting frames and anything I can get my hands on with chalkboard paint. Those painted vases look great! I like to paint pictures. But I love how paint can change a whole room! I love the idea of sprucing up old items with a fresh coat of paint! Being in the midst of wedding planning I am having a love/hate relationship with painting and diy projects! I hope to grow to love painting. I most enjoy repainting old, rather beat up pieces of furniture. I have been thinking about how much I have wanted to try painted vases! Your directions make it look simple! I really enjoy painting small rooms such as my bathroom. I paint it a different color at least 2x/year. I tweeted publicly about this promotion and my twitter id is @yarbr012 https://twitter.com/yarbr012/status/486298923988811777.. I like painting the bathroom. I like to paint little pieces of furniture. I enjoy painting old frames. A fresh coat of paint in a vibrant color make the frames pop. I love repainting old picture frames and adding a different color to them to spruce up my home for a change. Since we are building a new house, I am going to enjoy painting walls here very soon ;) Eventually would love to do some fun DIY projects like those vases sometime too though! So pretty! It's amazing what a coat of paint can do! I like to paint the walls. It completely changes the look of our house. Not sure what happened to my comment! I like to paint old chairs, but I'm gonna try some glass painting! I have several vases just sitting around collecting dust, now I know what to do with them. Love the idea of not using a brush also. I love repainting the walls in my house. We have plans to paint our master bedroom this summer. My walls -- makes such a difference! I'd like to spruce up our bedroom and bathroom. We tend to decorate everywhere else first. So I'd enjoy that! I am not much of a painter now, but I think I'd enjoy painting mason jars for different holiday themes! I enjoy painting kitchen table set the most in my home. I love painting furniture! I painted a sewing desk that I found on Craigslist and I love it now! I have tweeted! :) https://twitter.com/11_CrazyCarters/status/489226464060256256 -Heather Mckenzie Carter, CarterFamilyof8@aol.com Thanks for the opportunity! I enjoy painting furniture. i love white color, so i like to paint all the furniture white. I enjoy painting our walls - love the accent ones! I love using a roller and painting walls -- and it makes such a difference in a room to have fresh paint. I am not the greatest at painting anything but I love choosing a nice color of paint to give walls and other things a pop of color. I love painting my bedroom walls! We recently moved back into our condo and we had to re-paint two bedrooms and our entire garage!! I have seen DIY for these before and have been wanting to try it myself... I have a few glass vases too! I love your color combo though! I love painting walls..it's a lot of fun. I like painting the walls. I would love to paint the wardrobe in my entry room. I recently painted our bathroom, and then stenciled an all-over wallpaper pattern on top. It was a LOT of work, but I love it! Wow! They look awesome! I've only painted the walls in my house...pretty proud of that though! Painting thrifty finds is satisfying! Painting the walls in our home! it adds such a special touch :) I do love painting/staining any extra DIY projects too though like the desk & shelves we have made! I painted a china cabinet and distressed it to match our dining room table. I was so proud of the way it turned out! I liked painting the kitchen. I always enjoy painting picture frames to give them a bit more pop and color. I love doing small things like picture frames, vases, or baskets. Things that add just a bit of style to every room! I like painting my walls for a change! We're actually in the middle of a paint redo in our upstairs bathroom. Looking forward to the clean, white walls again! I like painting old furniture. I enjoy painting old looking wooden mirror frames.